As of April 2016, the National Living Wage will become law. This blog will quickly summarise some key points to bear in mind for businesses. 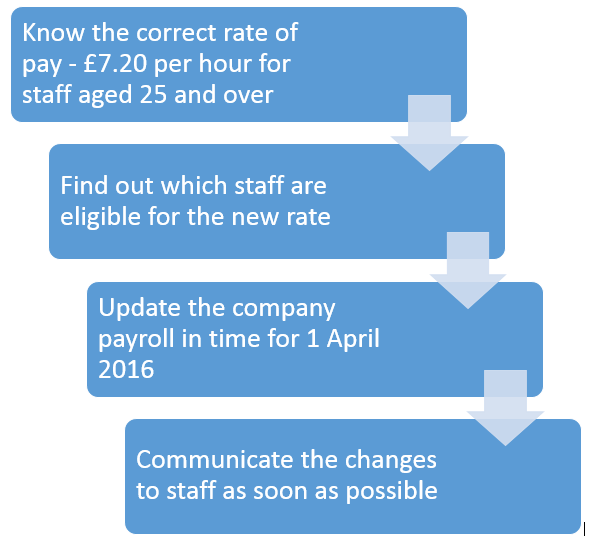 Be prepared & follow these steps to prepare your company for the National Living Wage in April 2016. The HMRC has the right to check payment records. If you discover you have paid a worker below the minimum wage, you must pay arrears immediately. 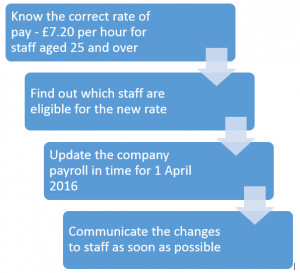 What’s included in the National Living Wage? John is 27 and works 40 hours a week. He earns £6.80 per hour or £272 a week. He pays £15 a week to rent his uniform and the money isn’t refunded. He also chooses to eat in the canteen, and pays £20 per week for his meals. This means John makes £257 per week (£272 minus £15) which is £6.43 per hour. This is below the minimum wage rate of £6.70. The National Living Wage is supposed to tackle Britain’s low pay problem. It marks the Conservative view that it is better to tackle poverty through work and not welfare. This means that employers, rather than tax payers, will support the poorest people of Britain by offering them better paid work. This is especially important for vast amount of people in Britain who work in low-paid jobs that require low-skilled workers. Because of the growth of technology, the number of jobs that require mid-skilled workers has been shrinking slowly for the past 30 years, but numbers have made a leap when the recession started in 2008. Jobs requiring low-skilled workers have increased – just look at all the coffee and sandwich shops that can be found on a typical high street compared with 10 years ago – However, mid-skilled workers who cannot find employment at their own skill level end up competing for lower-skilled jobs. There is a surplus of suitable candidates for these jobs, so employers are in a comfortable position and can keep wages down. Looking at these facts, it seems that this vast group of low-paid, low-skilled people will only benefit from the new law. One of the issues that might come up for employers is the ripple effect: when employees earning below the new Living Wage will get a pay rise, employees already earning more than the Living Wage might ask for a pay rise equal to that of their colleagues to retain pay differentials. Consequently, even if only a small percentage of the employees is earning below the Living Wage, this may in some cases still affect a large part of the company’s payroll, depending on employees’ assertiveness in demanding pay rises. If ‘the ripple effect’ does not take place, whether initiated by employees or by the company itself, the company will run the risk of undermining its own career ladders and progression routes. Resolution Foundation economic analyst Adam Corlett believes it’s vital that employers ‘create progression routes at work so that staff can be lifted out of low pay altogether’, which sounds quite idealist. It can thus be concluded that it will take more than a higher wage floor to tackle Britain’s low pay problem. The responsibility for its success is partly dependent on how well companies are guided by the government, how well they react to it, and whether they are capable of doing so. To what extent the New Living Wage will cause problems for smaller companies and specific industries can only be judged over time. At the same time, other questions remain unanswered too. For example, will the over 25s now start facing discrimination when they apply for jobs, bearing in mind that the minimum wage will eventually go up to £9 for over 25s? While benefits are cut, will higher wages stimulate people to work, rather than claim benefits? Perhaps more importantly, how does the government think it will protect the most vulnerable people, those genuinely unable to work, from these cuts? It is a complex matter! Szu Ping Chan, ‘Will you benefit from increases in the minimum wage?’, The Telegraph, 3 Sep 2015. Tony Dolphin, ‘Bleak Figures Show a Relentless Slide Towards a Low-pay Britain’, The Guardian, 19 Oct 2014. Press Office, ‘Half of All Employers Expect to be Affected by the New National Living Wage’, Chartered Institute for Personnell and Development (CIPD), 15 Nov 2015. Peter Spence, ‘Mapped: Where the National Living Wage Will Put Employers Under Pressure’, The Telegraph, 4 Jan 2016. The National Minimum Wage, ‘Employers and the National Minimum Wage’, www.gov.uk. ‘What is the Living Wage?’, BBC, 2 Nov 2014.